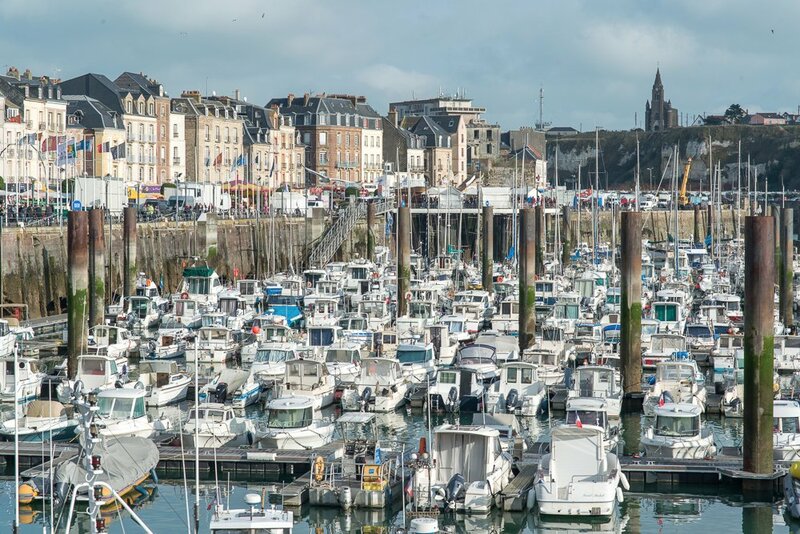 A mere 2.5 hours away from Paris, the quiet little port city of Dieppe often goes unnoticed by most travelers; however this quiet little city comes to life time to time to reveal its true Normandy flavor and French hospitality. 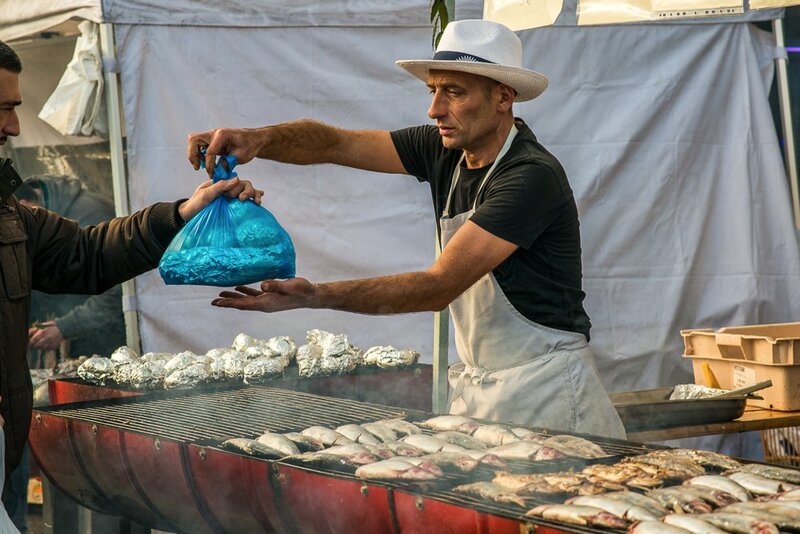 The annual Herring Festival this past weekend was no exception as the local Dieppoise fishermen celebrated their freshest catch along the lovely renovated boardwalk in Dieppe. As a Canadian I had come across the city Dieppe when speaking about our history. Thousands of brave Canadian soldiers disembarked and were lost on the beaches of Dieppe during a failed attack against the German occupation during WW2. Till this day the locals are quite fond and sympathetic towards Canadians and have several memorials dedicated to the honor the Canadian soldiers that day. Apart from history books I did not know much about Dieppe and as I came to realize it is quite off the main circuit for tourists in France, nonetheless it is a detour worth taking from Paris, especially when you are craving fresh seafood. 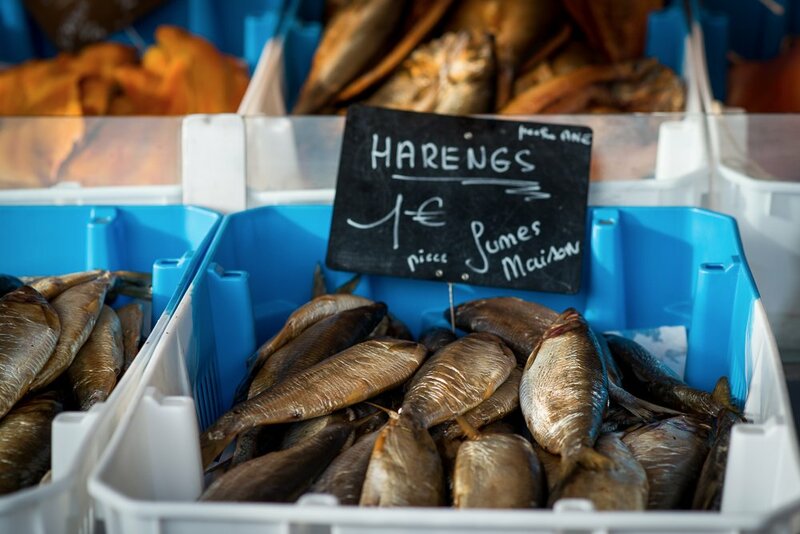 It turns out that Dieppe is the first French port for scallops along with many Atlantic delicacies such as, rays, herring, oysters, and many other familiar fish that have very different French names. Herring also known, as the “silver of the sea” to many fishermen in Europe, is one of the main catches in Dieppe. 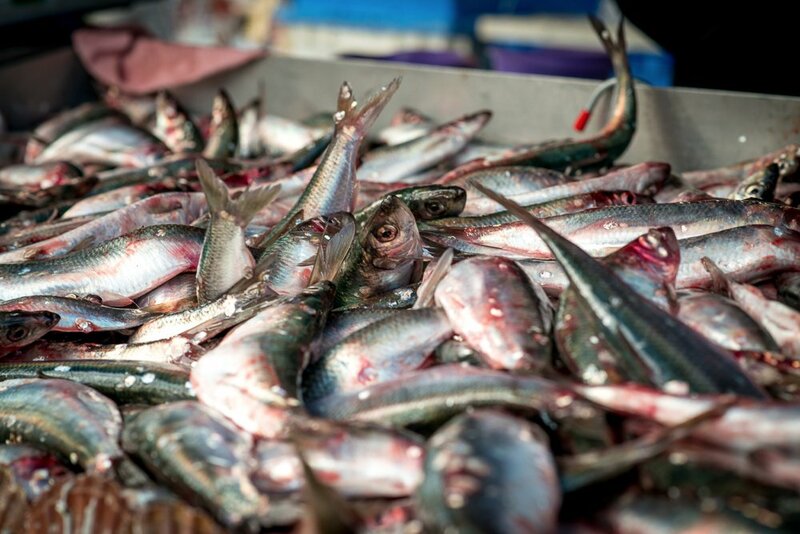 Herring is caught for consumption of its flesh and famous for its eggs, which are often cooked inside with the fish. As we strolled down towards the boardwalk through the busy weekly market we started to smell a thick mélange of smoke and fish. 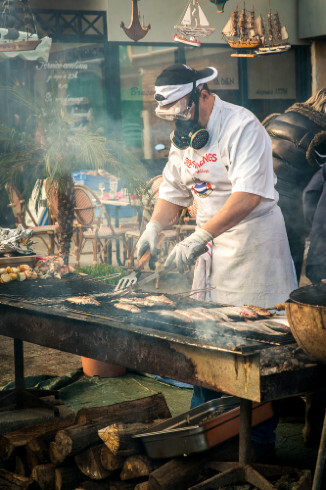 We got to the main street and found barbeques lined up in front of all the restaurants, with fresh fish stands, oysters stands, fair games, rides, and merchandise of all sorts in all directions. It was no wonder it took us 20 minutes to find any parking, I had never seen so many people in Dieppe. It was amusing to see all the different preparations and recipes for herring as each stand competed to stand out and create the most original, authentic and tasty herring of the festival. Smoked was a popular choice with huge barrels filled and covered with a mysterious mixture of local wood. 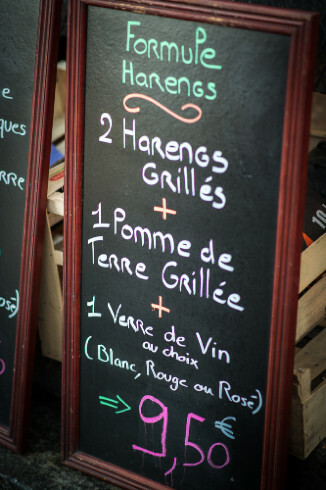 The most common method was grilled on a barbeque but with each restaurant modifying the accompaniments. Vegetable kebabs, fried onions, baked potatoes all done on the grill. The skilled cooks manning the grills were showing off the best of Normandy cuisine and having a great time entertaining the bystanders. 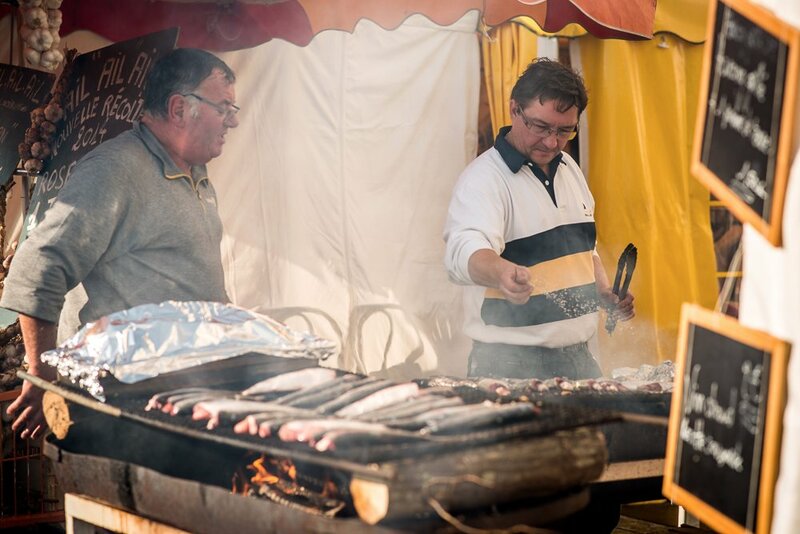 We pleased our bellies all weekend to the delights of Normandy’s best as with most events in France, it all starts with great food and ingredients. It was well worth the trip from Paris as we took a break from the hustle and bustle of the big city.